Geologica Carpathica has a paper on a new family of predatory cockroaches. Predatory? The authors, Peter Vrsansky and Günter Bechly, from the Slovak Republic and Germany, respectively, said that "unique adaptations such as strongly elongated extremities and freely movable head on a long neck suggest that these animals were pursuit predators." Mico Tatalovic in New Scientist said that "This exotic, praying-mantis-like cockroach that lived at the same time as dinosaurs was caught in amber about 100 million years ago. It is part of a new family of extinct predatory cockroaches that hunted at night." Dragos Mitrica in ZME Science said the insect was found at a mine in Noije Bum, Myanmar. "The specimen was one of many found in the area, and is related to today's praying mantises. Out of all the predatory cockroach lineages that evolved in the Cretaceous, only praying mantises survive today." Big predatory dictyopterans are represented mostly by praying mantises (Mantodea), which can be derived from extinct cockroaches. The authors described "the holotype specimen of a new species belonging to a morphologically-deviant new family." They said this species was probably a pursuit predator, "filling a niche previously not exploited by extinct cockroaches." The specimen was collected in a quarry in the Hukawng valley. The cockroach was found trapped in amber. The specimen was studied with a Leica M80 stereo microscope. They observed a male cockroach with detached right mid and hind femora. Its elongated head and large eyes were protruding beyond the head outline. All the leg segments were described as "extremely elongated and covered with dense setation (short trichoid hairs – sensilla chaetica)." As for the body, they wrote that "the preserved body length is about 4.5 mm, width is difficult to measure, but the body is very wide as in standard cockroaches (over 2 mm), a little narrower basally, pale, with black lateral maculas." In their discussion section, the authors said that they endorsed "a reclassification of Dictyoptera, in which the order Mantodea is phylogenetically subordinate within the Corydioidea (=Polyphagoidea) – a superfamily that includes diverse extant but also extinct cockroaches sometimes placed within Dictyoptera but outside the standard order of cockroaches." They said that the absence of spines on the walking legs suggested that this species was an active runner and pursuit predator, which evolutionarily lost the passive protection of spines. The authors felt that "the erection of a new family" was well justified as a result of "the unique habitus with numerous autapomorphies along with several plesiomorphies." Vrsansky is from the Geological Institute, Slovak Republic; Bechly is from the State Museum of Natural History in Stuttgart, Germany. 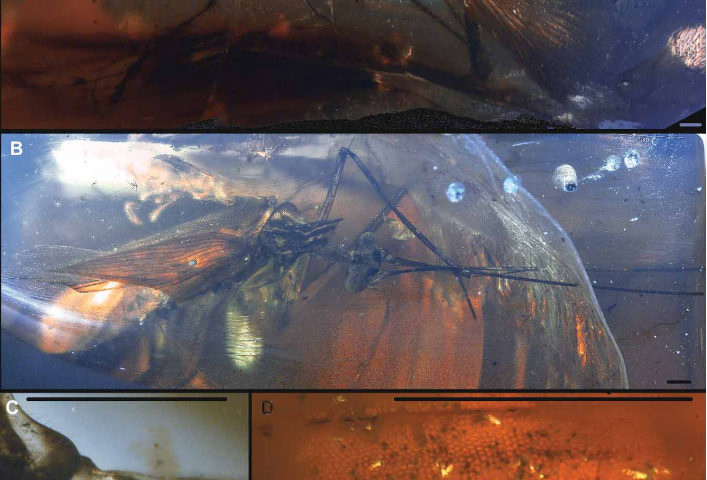 Vrsansky said in New Scientist that the specimen was one of dozens of preserved insects found in the area, making it the most important site of dinosaur-age amber in the world. Tatalovic wrote, "Many large pieces of amber contained complete adult insects, which should help reconstruct the history of the animals and their ecosystem." "Dinosaur-times cockroach" - wow, what do you get if you multiply a T rex by a cockroach? Nasty! Looks more like matispidae- a mantis-fly than a cockroach. Origins of the Tea Party.